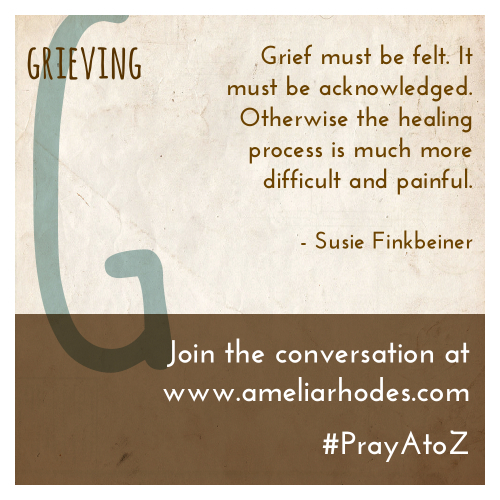 Today, we continue our series Pray A to Z, and G is for Grieving. If you’ve missed a few posts, you can get caught up on the series here. If you don’t have your printable prayer cards yet, you may download them for free, here. It’s quite appropriate with all that’s happening in Canada that today’s post is about grief. As you pray today, please include our northern neighbors who are grieving this tragedy, and are dealing with so many emotions right now. Today, Susie Finkbeiner shares with us about the need for grief, and the hope we have in the midst of it. Susie has also written a beautiful novel that deals with grieving. Be sure to enter the giveaway at the bottom of this post for a digital version of her book, My Mother’s Chamomile. The end of the story goes like this: Jesus comes into the bedroom, takes the hand of the young and lifeless girl, and says, “Daughter, wake up”. We like to think on that part. We speed past the frantic father, rushing to Jesus to have Him heal his ill daughter. We skim past the messenger coming to say that the girl had died. We don’t sit with the father in his grief. Because we know how it ends. The story has a good conclusion. Everyone is happy. The wailing women go home. The little girl eats lunch and, we hope, goes on to enjoy a full life. We try to forget or ignore or skip past the devastated father because his loss terrifies us. Part of us fears the possibility that his grief will become ours one day. Grief is uncomfortable. It’s full of negative emotions we’d rather do without. It means that we have lost someone or something dear to us. Our temptation is to put a flimsy bandage over the pain of loss, hoping that, if we don’t see it, it will somehow disappear. That isn’t how grief works. Throughout my life, I’ve experienced several losses. Loved ones passing away, jobs ending before I wanted them to, the death of key relationships. While each time of grieving was different, I have learned one thing. Grief must be felt. It must be acknowledged. Otherwise the healing process is much more difficult and painful. If we stuff the emotions down, or expect someone else to do so in their season of grief, all we do is start a festering wound that will only become more and more harmful the longer we conceal it. The Scriptures are full of rich lament from those in the middle of mourning. In my life, I have echoed the Psalmist, the Prophet, and even Jesus. Each of us will experience grief in our lives. We will walk alongside loved ones as they struggle with losses of many different kinds. Lament very well may be the language in which we pray through those times. Several years ago, a childhood friend went missing. A week later her body was found. She had been murdered. At first, I struggled with disbelief. That kind of thing didn’t happen to people I knew. It was too horrible to acknowledge. She was such a sweet girl. She never hurt anyone. Never. How could that have happened? I remember crying out in lament to God. I asked “why” so many times. I even questioned why God hadn’t intervened. At the funeral, my friend’s younger brother pulled out a jar she’d given him. Inside were handwritten notes of encouragement just for him. A treasure he would have for the rest of his life. A reminder of the love she had for him. I’m reminded that God has a jar, too. An emblem of His love for us. In His jar are all of our tears. He collects them, keeping an account of all our sorrows. He listens to our cries, for our grief and the grief of those we care for. He mourns right alongside us. Susie Finkbeiner is a novelist from West Michigan. Her novels PAINT CHIPS and MY MOTHER’S CHAMOMILE are both available from WhiteFire Publishing. Her third novel CUP OF DUST will release with Kregel Publications in fall 2015. 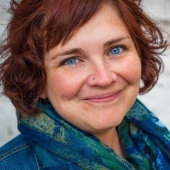 Susie is a wife, mother of three, and an avid reader. She enjoys time with her family, coffee dates with her close friends, and quiet moments to read and write. Write down names of people who have lost family or friends to death in the past year. Write down names of those who’ve lost marriages, homes, businesses, health, or other significant relationships. Pray that your community would be one that wraps its arms around the grieving, and offers words of hope that heal and help rather than adding to the burden. Ask God to show you practical ways you can serve the people on your prayer card. Susie is giving away a digital copy of her latest novel, My Mother’s Chamomile. This beautiful novel follows the journey of a family who serves their community during times of grief, and how the community responds when this family suffers a loss of their own. Enter using the Rafflecopter widget below! Winners will be drawn next week Monday October 27. Great piece. Grief and I have an unfortunate history. I lost both of my parents in my 20s-early 30s and I was widowed at 40. I recently stood by my childhood best friend as she bid farewell to her father (her first deep loss). One common thread through it all: God is here. He is the great comforter. I’m so sorry, Melanie. What tragedies. You’re right, God is near. It’s the only way I’ve been able to get through losses in my life. OH Melanie, I’m so sorry. Thank you for sharing with us. I’m so thankful that in the midst of our darkest valleys, God does not leave us alone. He is truly the Great Comforter. Oh, Melanie such loss, and to still know He is our comforter… that is beautiful. I always love that image of God collecting our tear. He knows hearts and none of our struggles are lost to him. Such a beautiful imagery He gives us through Scripture! I remember the first time I understood that part of the Bible. It was such a revelation of God as our very good Father. Such love. Interesting that this should end up on my Facebook page today. I am suffering from self imposed grief. I have not lost recently yet feel grief daily. Reading this has helped but most interestingly led my to prayer a-z for depression and mental illness which is what i truly suffer from. God works in mysterious ways. Give me strength. Denisre, I am so sorry for the heaviness that you carry each day. I’m thankful that God brought you here today, and hope you see that as His loving hand directing you. May He give you peace and comfort, and a community who will uphold you. Oh, Denise, I feel for you. I’ve been there and it is so difficult. My hope is that you can find peace and joy on the other side of this grief. You are a precious and dearly loved daughter of God. I feel as though when God knit me in mother’s womb, He put just a little something extra for me to deal with the grief my entire life. I grieve the child I never was, will be, the mother I never had and never loved me. I grieve the fact that because of cancer at an early age, I cannot have children. I grieve losing my father to cancer (my mother died 20 years ago, but I must confess to much grief there). I grieve now that the cancer I have now is unbeatable. There is a lot of grief – but I believe this is the first time in my life that I written it down and stated it. Beth, my heart hurts for all you’ve been through. You know that you are dear to me. I pray for peace and comfort. You are a precious daughter of God’s.